Re-posted from 2009 for your viewing pleasure! For those of you with little girl's, I would like to share some tips for styling and maintaining curly hair. Let me first introduce myself- My name is Nikki (coincidence? lol) I have a 4 year old daughter- "A", who has 4A hair mixed with some 3C. I didn't know how to properly care for it or style it for a while. 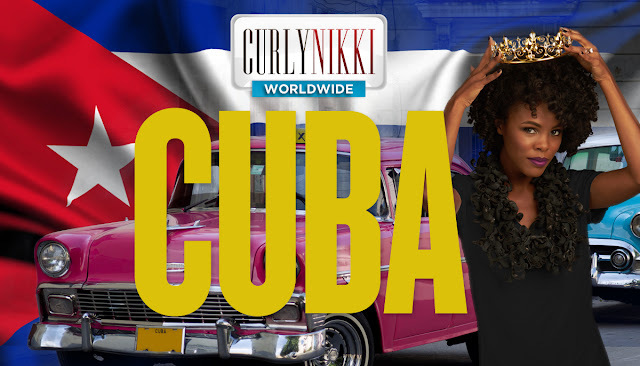 I started researching Biracial/African American hair care and have learned so much through various websites like Curly Nikki and many other hair forums. Wash once a week with Organix Coconut Milk Shampoo and Herbal Essences Hello Hydration Conditioner. I almost always leave her conditioner in (www.tightlycurly.com). I usually wash her hair on Saturday. I style her hair on Sunday. I keep her styles in for one week. They can last longer but I choose to take the style out for wash day. If I need to use rubber bands I will soak them in olive oil first, and make sure her hair is very well moisturized to protect it from breakage. So, if I'm adding rubber bands to the base of her hair, I will apply a little olive oil, then put the rubber band that was soaked in olive oil on. I do the same thing for her ends, try not to wrap the rubber band too tight. I will spray her hair a few times a week with Giovanni Direct Leave-in mixed with water to keep it moisturized. I also apply shea butter mixed with coconut oil to her ends a couple of times per week. If 'A' has hair accessories in her hair, I try to take them out at night. If she has beads in, I will usually leave them in for a few days or more. If she does not have a style in, I will detangle at night with HEHH (hello hydration conditioner) mixed in a spray bottle (water) and a wide tooth comb in sections, each section I put a big braid/twist in. We usually end up with 6-8 sections. I put on her satin bonnet and it usually stays on all night. In the morning all I have to do is take the sections down and finger comb. I like for 'A' to have a variety of styles to choose from. I know the same thing can get boring sometimes. She loves coming home from preschool and telling me how much so & so liked her hair. Most of the little girls in her class have long straight hair, so it's a nice feeling that not only is she loving her hair, but so are her friends! I find that these twists last longer than regular two strand twists. This style will take between 2-3 hours depending on how much hair your child has, so be prepared to take breaks. When I do her twists, I use shea butter mixed with coconut oil. No rubber bands required for this style. Part a section of hair, split it in two, start twisting each individual section, one clockwise & the other counter clockwise, then start twisting them around one another. Don't you love 2-in-1 styles?? After you take your child's twists out, let her rock a twist-out for a few days! As you know, you can make many cute styles with cornrows. Go in different directions, make shapes (see my star & pumpkin style) do layers and of course add beads or barrettes to jazz it up. A cute a simple style for little girls! If your child's hair is already detangled this should only take 5-10 minutes. Smooth the hair down with some shea butter. This should only take around 10 minutes if the hair is detangled. Put the hair in a ponytail, split it into two, fold one side under towards the ponytail holder and place a couple of bobbypins to hold it down, do the same thing on the other side then add a bow! Styling your daughter's hair should really be about Mother and Daughter bonding time. I don't make it into this big chore. I try to make it as fun as possible for her. We act silly and sing songs all while she is getting her hair done. I make sure we take breaks on styles that make 2+ hours. I let her take a nap, give her a snack, and let her play with toys. 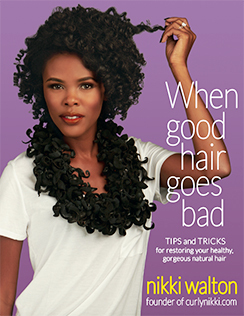 I am constantly learning new things about natural hair care every day. I plan on slowly but surely switching to all natural hair products for her hair. For now, this is what works for us. I have done everything from the au natural look, to cornrows, to flexi rods, to bantu knot outs, to mohawks! I would love to share them all with you now but I think I would be here all day. What's your favorite hairstyle for your little one? Thanks for sharing your tips Nikki (A's mom)! My niece has curly hair and her mom was having a tough time combing/styling it. I saw your blog and sent it to her right away. She recently sent me some pictures of my niece in the cute braids. Thanks! Thank you so much for sharing!! I don't have children yet but know a few friends w/little girls I can share this with. She is so adorable and the styles are creative and easy! Thank you sooo much for sharing this! These styles are very cute & hopefully I can recreate them for my daughter! Awesome. Not sure what my babies hair will be like-- as she still ain't growin' any :)! But great tips. THANK YOU! Ur daughter is beautiful! Thanks for this info as it was right on time for me:) I have a three-year old daughter and we are battling with dryness right now and a lack of styling ideas on my part :/ I should be ashamed of myself...lol...I can't wait to try some of these styles on her!! Thank you SO much for this post. I have a 6 year old with probably 4a/b type hair (still learning how to classify hair types) and I wasn't really taking good care of her hair until I went narural and started using better products. Isn't that something? I'd braid and bead her hair and leave it in for a month, and when it was time to take the braids out, her hair would be all linted and tangled. But now that I'm natural (newly - BC'd on 10/10/09), I've been paying more attention to what her hair needs as well. We'll be on this natural journey together. I don't know if I can keep up with washing her hair once a week though....lol...but I'll definitely give it a shot. Thanks for sharing your weekly routine and a few of your many gorgeous styles! This is too adorable. 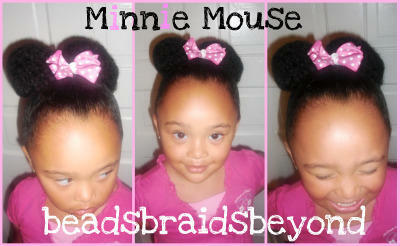 I love when mothers actually take the time to learn how to do their childs (Bi-racial or not) hair. It is truly a bonding experience. Nothing drives me more crazy than to see a biracial child out in public looking like a hot mess with their hair. Your daughter is beautiful & take a bow for learning how to do her hair. Great work mama! Your daughter is so beautiful and you have some really beautiful hair sytles. My daughters hair is more of a 3b so when I try to do the braids and twists they never last past 3 days. I even took her to a hair salon that specializes in braiding childrens hair and they put in tiny box braids by day 3 starting to fuzz, end of one week they needed to come out ASAP!!! But I do take care of her hair is the same fashion as you do. I will definitely be following your blog even though I have a 4yo son... His hair is natural and he's been rocking twists and braids for about going on a year..yay for natural babies! This blog is exactly what I was looking for. I too have a daughter and i want her to truely love her hair. Now all I have to do is learn how to braid. I love her blog and her daughter is a cutie! I found it recently via a link from another website. 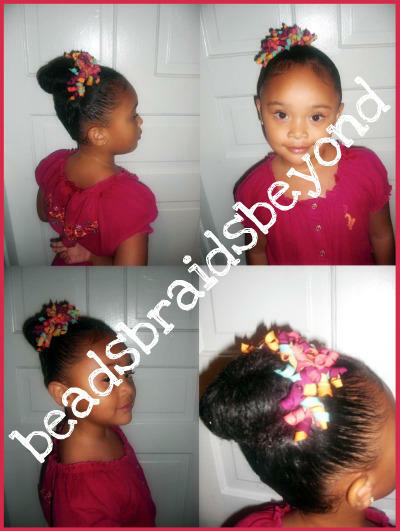 I have a four year old myself and have always loved to do her hair, my neices, etc. I love the styles that you try out. You've given me lots of new ideas. Nikki, I love your blog and recommended it to my daughter who has a 18 month old little girl of her own. I love your blog and I'm a fan of your daughter's hair LOL I think its wonderful what you're doing. There are so many mom's out there that need help with styling their daughters hair. You're an inspiration to many. I will see you on naturallycurly! Hey Nikki, love the feature of A and her beautiful hair. You take such good care of her hair. Thanks for sharing your knowledge for the benefit of other moms. hey nikki, I think your work is awesome. your daughter's hair always looks fly. keep up the work, and I love you blog, I get so many ideas from you. gonna try another one of your stlyes tonite. this is susan from cafemom and myspace btw! Love the spotlight on child's hair. I am still traumatized from that video a few months ago about the mother torturing her daughter while "doing" her hair. I too get irritated when I see a child's hair looking a dry frizzy mess, has extensions or weave (children have no place having fake hair) or pulled so tight they are losing their edges. Makes no sense! Thank you and keep up the good work. AND thank you so much for the blog to help passing on the education to others. Fabs! i love the alicia keys hairstyle on her. that came out really nice! Mya is adorable & you are so talented. I have learned so much from you (however Aleigha's hair isn't quite long enough to try some things yet) but you inspire me to wanna do right. 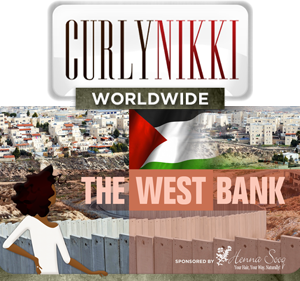 Thanks CurlyNikki for all that you do. What I like about you is that you give excellent info, you're real cutie with a low-maintenance manner and have a loving family. I like the fact that you present yourself as one of us, a regular chica and not some model wannabe who constantly bombards her visitors with endless pictures of her hair and clothes (yes she even lives in a "fairy town kind of place, Los Angeles") and it always seems to envoke the same ol' followers with their constant "oohs & ahhs" and "I wish my hair was that long type of drooling" and her poses always seem to say "don't wish you could be fly like me--too bad". The first times in was cool but day-after-day, it gets real old. Thanks Nikki for keeping it real! P.S I just saw the video of your appearance on Tyra Banks and you were regular chica, marvelously fly! Thanks for these tips! My daughter is bi-racial and her hair is a fine curly texture, closer to her dad's silk-like hair (though he is half native american, so his hair is a big thicker, hence the density of her hair). The bun is our go to hairstyle. She is only just over a year and a half, so her attention span is like that of a gnat right now. Doing more complex hairstyles wil obviously have to wait. Usually I just detangle it while she plays with a toy of hers, and then I roll it up into a bun. I leave some of the curly hair out in the front to add some character. People love that do, but I will have to keep some of these other ideas in mind for when she is a bit older. 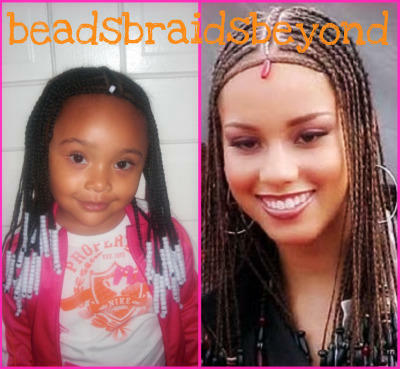 Love all the styles presented, especially the Alicia keys braids! No worries! On the flip-side, I have to care for a daughter's hair who is more like her fathers than my thick natural hair. Her dad has wavy hair, but he is white and so his hair is still much different. Since I have done my friends hair (one who is mixed, and another who is white) plus caring for my own, I came into this with a bit more experience, but there is still a lot of learning to do.